Includes Saint Augustine: A Voice For All Generations and Restless Heart. 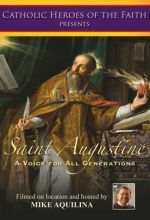 Saint Augustine: A Voice For All Generations — ﻿St. Augustine of Hippo (354-430) is a preeminent Doctor of the Church and the patron of the Augustinian order. His works, including The City of God, On the Trinity, and The Confessions, have had an inestimable impact on the Church and, by extension, on Western Civilization at large. Yet, where did such faith begin? After rejecting his mother’s Christianity as simplistic and restraining, Augustine embarked on a path towards self-gratification, marked by the pursuit of money, political power, and sexual pleasure. 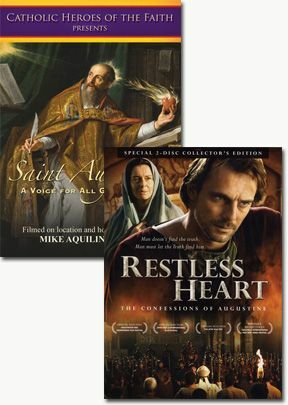 This documentary, hosted by EWTN’s Mike Aquilina and shot on location in Rome and Milan, explores the conversion story of one of the most significant figures in church history. Travel back to the fourth century and discover how Augustine became a “Voice for All Generations.” Includes English and Spanish languages and subtitles. Restless Heart — 430 A.D. The Roman Empire is beginning to crumble. The Vandals and other marauding tribes spill through the gaps in Roman defenses. And one of the greatest saints of the Christian church stands between his flock and the barbarian invaders. As he attempts to negotiate between the proud Roman authorities and the implacable Vandal king, Bishop Augustine recalls his own life before Christianity... 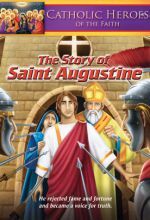 In this stirring and epic new film on the life of St. Augustine of Hippo, follow the great saint as he rises from his reckless days as a youth to his accomplishments as a renowned but dissolute orator. Though worldly success and riches come his way, including a position in the imperial court of Milan, satisfaction and peace elude him. It takes a confrontation with the Christian bishop Ambrose and the countless prayers offered by his patient mother, Monica, to break through his intellectual pride. Starring Alessandro Preziosi, Monica Guerritore, Johannes Bandrup, and Franco Nero. Widescreen.